It’s winter, the kind that makes the cold go straight to your bones, no matter how warm you think you’re dressed. The only thing that warms me up on a cold winter day is a bowl of hot soup. 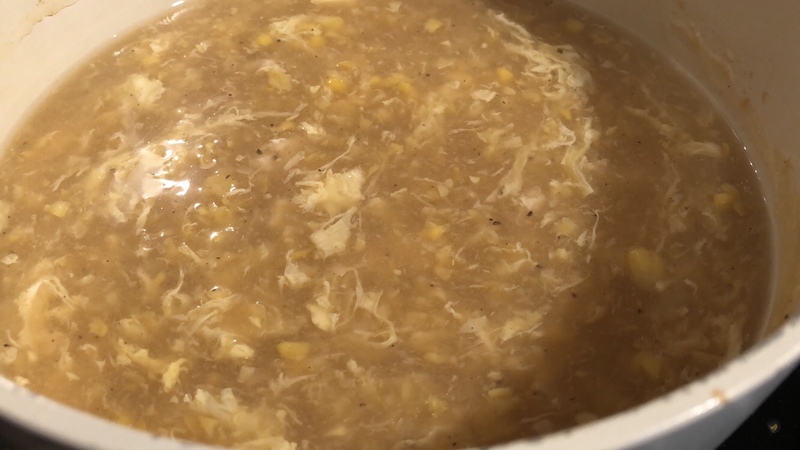 I’ve already put up a recipe of Hot and Sour Soup that I make very often, but recently i’ve added Chicken Corn soup to the mix, because it’s gonna be a long winter, and variety is nice. Now if you want you can make your own chicken stock, which is what I do sometimes. Or you can use store bought chicken stock. I on the other hand, use chicken cubes when i’m in a hurry, and I almost always am when i’m making soup. SO this recipe is with chicken cubes, but you can easily switch to your homemade chicken stock or use store bought chicken stock instead. Start of by bringing the water to a boil. Add the chicken cube and boneless chicken to the boiling water and let everything simmer for 5 minutes. During that time in a small food processor pulse 3/4 of the can of corn until it’s crushed. The 1/4 can of corn will add a bite but it’s nice to have a majority of crushed corn in the soup. You can also just use a can of crushed corn instead, but I like crushing my own corn! After 5 minutes add the corn to the pot along with the vinegar, soy sauce, hot sauce and salt and pepper. Taste to see if anything needs to be added. Then add in the beaten egg, stirring once or twice so big lumps of egg don’t form. Then in a small bowl mix some water with the corn flour to make a paste and add it to the soup, mixing constantly so no lumps form. That’s all! Just let the soup bubble for a minute or two once you’ve added the cornflour slurry so it can thicken then serve! It goes great with garlic bread, or crackers.